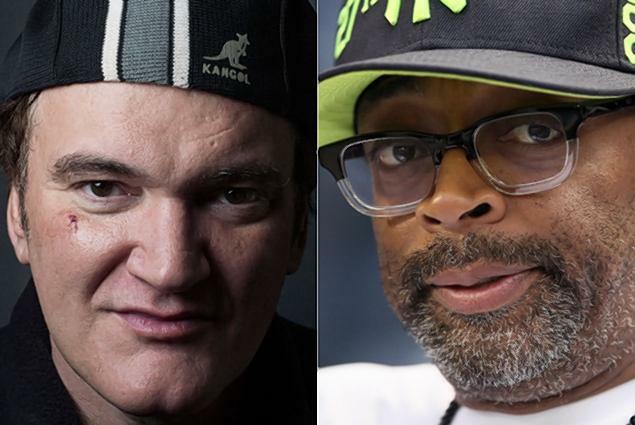 A long-standing feud exists between two icons of American cinema, Quentin Tarantino and Spike Lee. This flame was reignited recently with the release of Tarantino’s much-anticipated blood and guts slavery epic Django Unchained. In the 90s Lee’s criticism of Tarantino’s output was moulded around the director’s over-eager use of the infamous N-word. Lee’s argument has always been that Tarantino uses the word simply to coat a stylish African-American sheen to his characters. There’s no need for it, Lee believes, because it isn’t authentic or genuine. Or maybe he just doesn’t believe white directors should be allowed to use it. As a rebuttal Tarantino maintains the sacred role of the writer, defending his use of the word because he has to submerge himself in the world of his characters. American Slavery Was Not A Sergio Leone Spaghetti Western. It Was A Holocaust. My Ancestors Are Slaves. Stolen From Africa was Lee’s response to Django Unchained. This will seem a tad melodramatic for anyone who’s actually seen the film – interestingly Lee hasn’t. Tarantino has the added advantage of historical accuracy in this case. The N-word was used frequently in circulation in the American Deep South in the years coming up to the civil war. Lee’s recent attacks on Django are well wide of the mark. Tarantino has long been a filmmaker seen more for his influences then for the actual films themselves. His movies are always described first and foremost by what genre he’s tearing to shreds in his fabulous ultra-violent, ultra-humourous way, or by which filmmaker or national cinema he’s borrowing from. 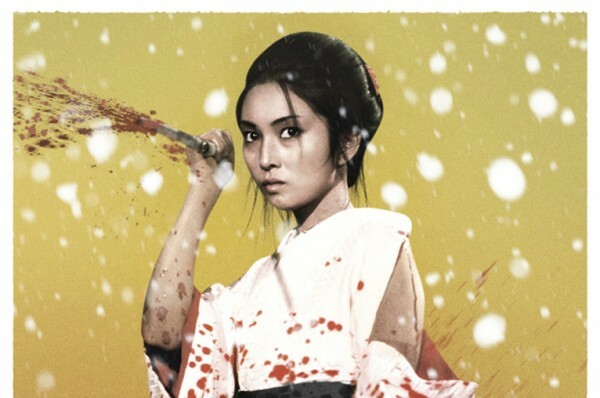 In Kill Bill it was to the Far East and the vintage samurai epic Fists of Fury (1972) and Japanese revenge saga Lady Snowblood (1973) that he sought inspiration. Pulp Fiction was the ultimate post-modern reinterpretation of the American gangster film made famous over the years by the likes of Scorsese. With Django, Tarantino returns to one of his favorite directors, Sergio Leone and the spaghetti western, a sub Western genre, mainly made by Italian filmmakers throughout the 60s and 70s. The genre’s penchant for lone heroes adrift in the mid-west is crucial to Django Unchained as at the heart of the film is the story of Jamie Foxx’s freed slave and his quest to save his captured wife, Broomhilda (Kerry Washington). By going much further in his vision of violence in the old west, Tarantino concocts a brutal and shocking cocktail in Django, but one dappled with humour. Coming straight out of Blazing Saddles there’s a scene where a gang of slack jawed, Southern hillbillies with shoddy KKK white masks are planning a night raid against Django and his partner in crime Dr King Schultz (Christoph Waltz). What should be a scene of horror rapidly descends into slapstick material as one by one the men complain that they can’t see out of the make shift masks. Eventually one of the guys, whose wife made said masks, storms off in a huff. It’s funny but it isn’t particularly tasteful. Then again deriving comedy from moments of unimaginable horror isn’t something new; comedians have been doing it for decades. 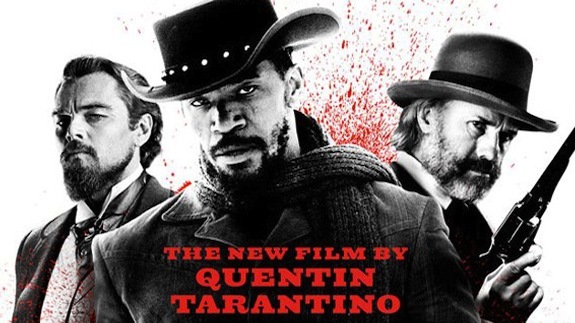 It is in fact Tarantino’s seamless mix of comedy and violence that makes Django Unchained such an unmitigated delight. When the deaths do come and they come almost immediately and rarely let up, the violence is brutal and inhuman, shot through with a dash of wit. Cowboys are gunned down at close range, their brains burst open like volcanic ash and slaves have hungry dogs set on them, their flesh and bone torn apart in harsh close ups. It’s relentless and hard to watch in a number of places. The torture endured by the slaves is atrocious. 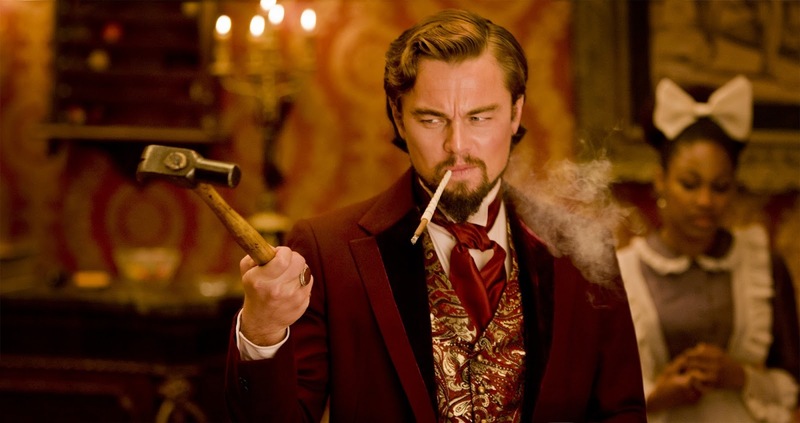 So is this over the top style of violence in Django Unchained justified? When you take into consideration that the history of slavery will be worse then anything a filmmaker could paint on the big screen you see all the gory death in a more favourable light. Django Unchained is only a movie at the end of the day and this style of on screen violence isn’t utilised by its director just for the sake of it: no it’s rooted in his vision as an auteur of cinema. This pop culture gore is part of Tarantino’s fabric as a filmmaker. Myths and fairy tales pop up numerous times in Django Unchained. The opening sequence involves a gang of slaves being led through a midnight forest that’s ripped straight from Grimm’s Fairy Tales. Icicles hang off the branches in elaborate fashion and out of the mists appears Schultz, riding his elaborate carriage like a magician come to free our hero, which is exactly what he does. Kerry Washington’s character is rooted in the fairy tale through the name Broomhilda. 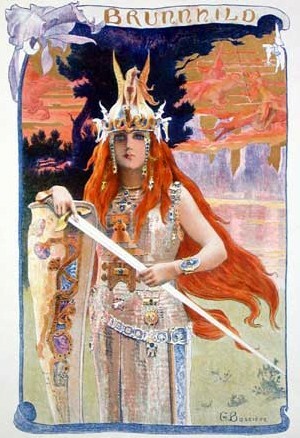 Schultz informs us that Broomhilda is a famous German folk tale about a princess imprisoned on top of a mountain by a dragon. The parables with Django’s quest here are obvious but the connection they bear to Tarantino’s gifts as a storyteller run deep like Mountain Rivers. The director’s talents as a writer are clearly still growing. Not only can he craft iconic characters’ that sing catchy one-liners, but his stories are now enriched by a mythological grandeur. He’s widened his scope past the millions of films he’s seen and taped into age-old stories that tell us what it is to be human. The visuals in Django Unchained are excellent. In fact any area that could be considered a technical element is accomplished here. The cinematography by three time Academy Award winning DP Robert Richardson is a work of art. His vision of the Wild West is operatic: shots of Django and Shultz riding over snow capped mountains, streaked with the pink rays of a setting sun, or galloping through prairie lands dotted by log cabins and lonely farms. The decision to shoot in original 35mm film was clearly the right one. Costumes by Sharen Davis are wonderfully impressionistic in their playfulness with colour: Django’s cerulean Valet uniform, Broomhilda walking through a field of wheat in a buttercup yellow dress. Even the opening credits are gorgeous. The actor’s names are painted in vast blood red figures over desert plains to the tune of Luis Bacalov. Tarantino has always had a flair for great typefaces. Much has been made of the acting in Django Unchained and it’s easy to see why. 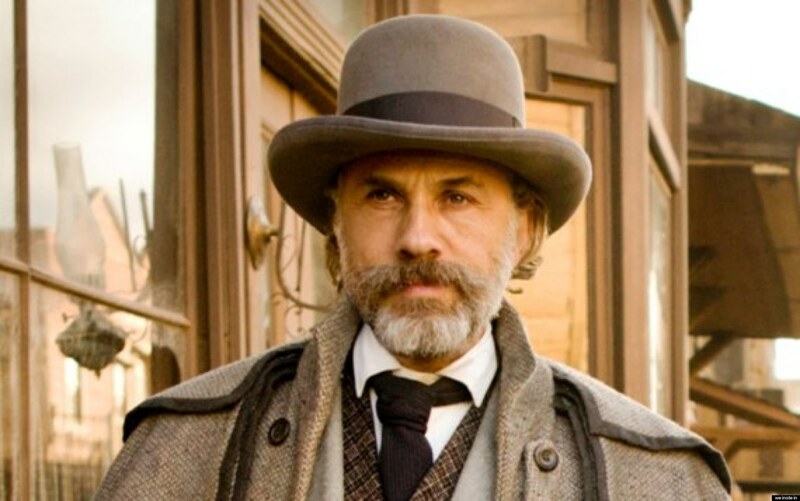 Not only are the actors (Christoph Waltz, Leonardo Di Caprio and Jamie Foxx) wildly accomplished in their performances but the characters they’re playing are so well crafted and unique. Samuel L Jackson rips to shreds the jovial Uncle Tom stereotype with his portrayal of villainous house slave Stephen, fiercely loyal to his white owner his malice is shocking. Calvin Candie is a pantomime villain drenched in Francophile culture, brought to life with a lot of panache and over the top gestures by Di Caprio. Waltz for my money is the best of the lot. He sings Tarantino’s dialogue. At almost three hours Django Unchained is too long. The film’s third act is entirely irrelevant, not only because it would have worked much better if it finished half an hour earlier but also because this is where we must endure the cringe inducing Tarantino cameo. Here he pops with quite possibly the worst Australian accent ever committed to film. But these are minor quibbles; for the most part Django Unchained is an extraordinary filmic achievement, drenched in the blood and history of cinema.